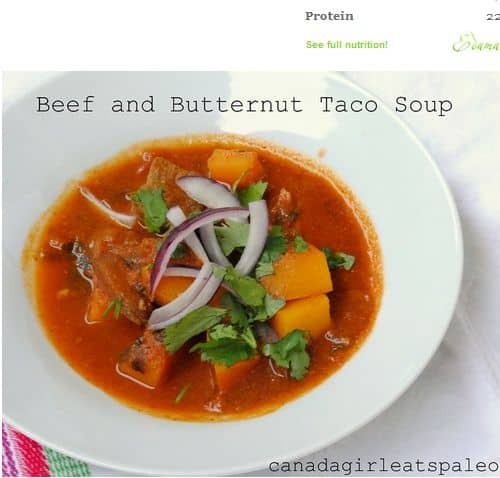 Looking for an amazing paleo taco soup recipe? 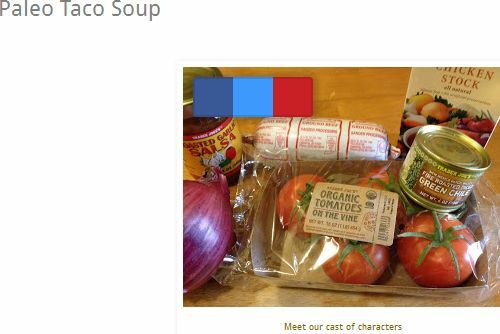 This roundup of 7 100 percent paleo taco soups lets you see an overview of all of the best paleo taco soups, categorized by type of soup, and find the perfect one. 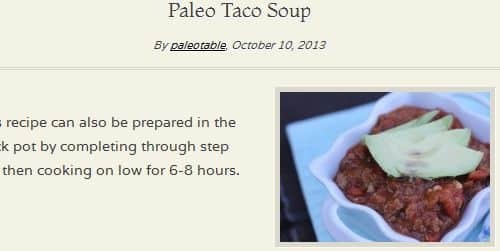 Looking for Paleo Taco Soup? Wondering what Paleo Taco Soup is? These 7 100% paleo taco soup recipes give you the bold flavor of Mexican foods without all of the corn, beans and cheese that aren’t part of the Paleo Diet. Instead, you get the rich flavors of cumin, tomatoes and various peppers that actually make Mexican foods so delicious. 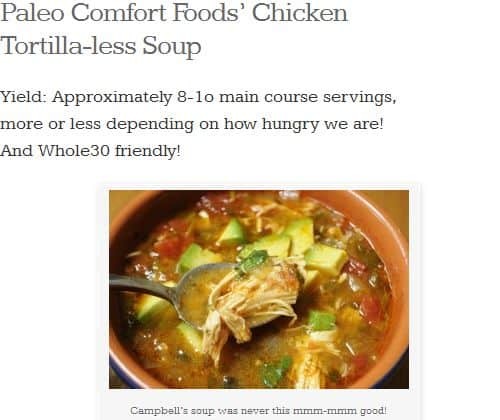 Scan through the listing below and find the perfect paleo compliant taco soup recipe for you. This simple slow cooker version of paleo taco soup forgoes the typical ground beef for shredded chicken and adds in an unusual ingredient, pumpkin puree. In addition, the more typical fire roasted tomatoes, cumin and chili powder are used in the recipe. Everything is added to the crock pot in one simple step. 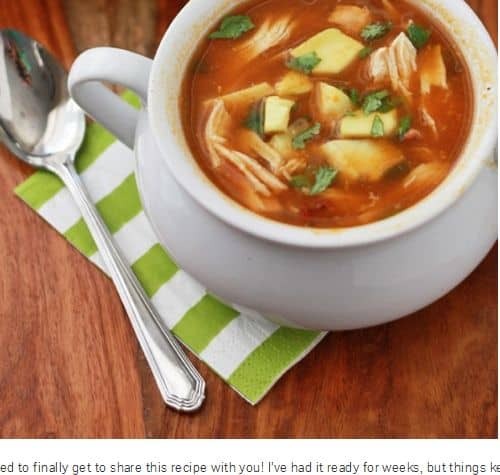 This Paleo Chicken Tortilla Soup could also be described as a Taco-less “Taco Soup”, as it contains ingredients like homemade taco seasoning (cumin, chili powder, garlic powder and cayenne), jalapeno, poblano peppers and fire roasted tomatoes. 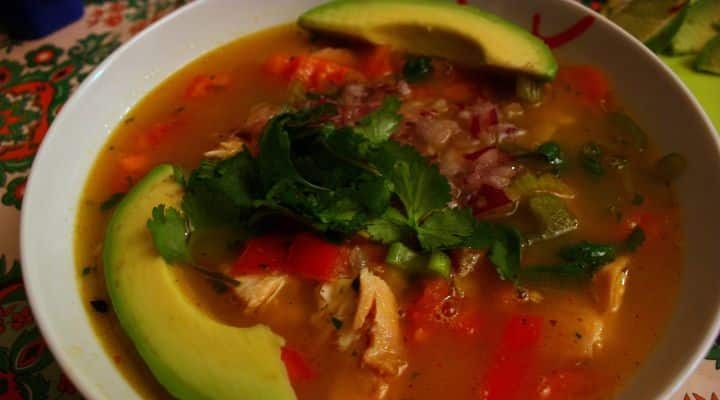 It is garnished with fresh cilantro and avocado slices, and contains a lot of chicken – shredded chicken breast along with chicken broth. This one pot version of Paleo taco soup incorporates chunks of butternut squash to give the soup a heartiness, along with bone broth and beef chunks. The seasoning is produced by fresh onions, tomatoes, and bell peppers, along with a blend of garlic powder, cumin and turmeric and fresh cilantro. This slow cooker version of Paleo Taco soup combines carrots, bell peppers, onions, garlic and fire roasted tomatoes with browned ground beef. The instructions are simply to brown the ground beef and combine everything in a slow cooker, making this a very simple slow cooker recipe. The instructions here, which are brief, listed on an image card, suggest finding a paleo taco seasoning or making the seasoning from a blend of your own herbs, so some additional work will go into finding a great paleo friendly taco seasoning recipe. This recipe combines all your favorite ingredients that go into tacos, including onion, garlic, chili and cumin, green chilies and salsa. Just make sure you choose Paleo friendly versions of the chili powder, roasted green chilies and salsa (ideally the salsa would also be homemade). The soup includes chicken broth along with all of the herbs and spices, so an option when you are looking for an alternative to chicken soup. This easy one pot slow cooker taco soup is a blend of ingredients, many of which are no prep like chili powder, garlic powder and canned fire roasted green chilis, make it quick to prepare. The recipe estimates 10 minutes to chop up the tomatoes and brown the ground beef before combining in the crock pot. This dairy free, grain free version of paleo taco soup includes zucchini as a main ingredient, a variation on other recipes. The author recommends using homemade chicken stock for the soup, but gives the option of using ground beef, ground turkey or ground chicken for the soup. Other ingredients include fresh lime juice, jalapeno, green bell pepper and a homemade taco spice blend recipe of various herbs included as well. We hope you found that one of these delicious taco soup recipes perfect for your needs. 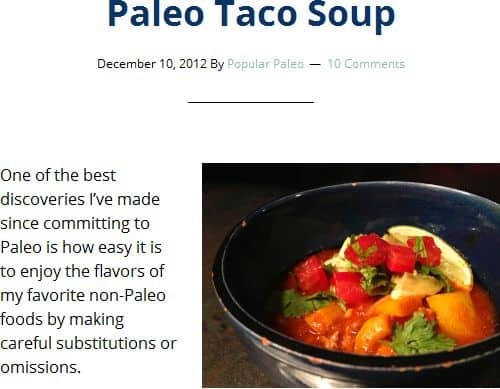 If there is another paleo taco soup that you feel should be included in our roundup, or have any other feedback, please leave us a note in the comments. Thank you!